What Is Your Favorite One Year Only Car Design? Although with each passing year automakers are finding new ways to stretch a maximum amount of life from each automotive redesign, there was once a time when a new model year likely meant a new car—at least for the companies that could afford it. This weekend we want to know what one year design captured your automotive desire and still makes you wish it had lasted much longer. Whether you think there was something about a one year only facelift or you are captivated by the striking styling of a car that was completely redesigned the following year, tell us about your favorite car or truck design with a short shelf life. What is your favorite one year only car design? Narrowly beating out almost every car GM made the same year and every car Plymouth built between 1957 and 1961 is the 1959 Desoto, my hesitant but final choice for my favorite one year only car design. Huge fins and outlandish styling were the norm that year, but something about the unique design of the Desoto makes it particularly attractive to me. The fact it was one of Desoto's final years combined with their extreme rarity 50 years later only serves to make a great design even cooler in my eyes. 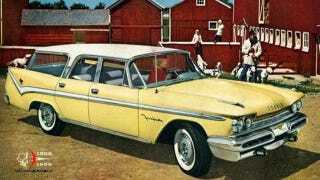 Without question a 1959 Desoto Fireflite Shopper Station Wagon will forever hold a spot in my fantasy garage, even in the likely event I'm never able to actually find one.